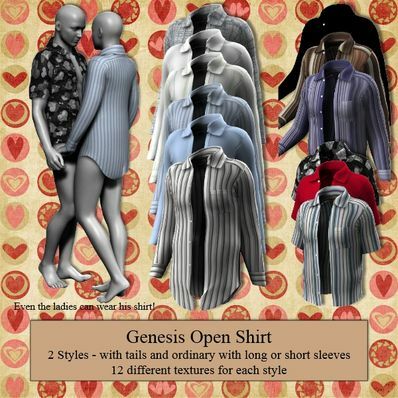 An open shirt for Genesis for use in Daz Studio 4.5. Two styles - shirt with tail, and ordinary shirt with long or short sleeves. Several textures included. Unzip and copy the data, People, and runtime folders to your "/Documents/DAZ 3D/Studio/My Library" folder. Your work is absolutely incredible! Thanks! This is so usable and needed by almost everyone. This is better than anything I have ever seen at Daz or Renderosity. Amazing Creation. Thank you soooo much. I love having this style of shirt available, so many thanks for offering it! Fil has been Updated. Please re-download.